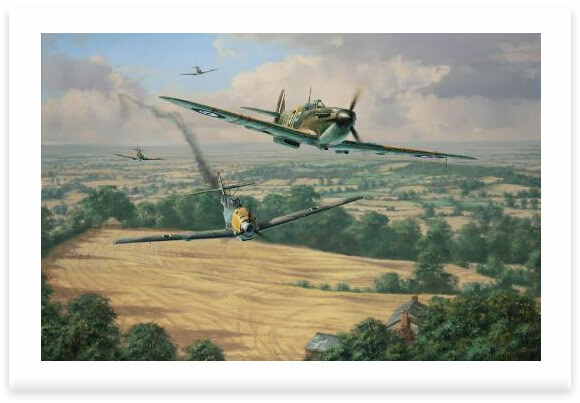 Released as a pair with HOMEWARD BOUND, Anthony Saunders' new painting High Summer, the second canvas in his new Battle of Britain Portfolio, portrays Spitfires from 92 Squadron as they successfully engage Me109's over the harvested fields of southern England, in August 1940. The desperate action of aerial combat is beautifully captured in this compelling and accurate reconstruction of a famous fighter squadron at war. Each edition in Anthony Saunders’ new pair of prints commemorating the Battle of Britain have been signed by two distinguished Battle of Britain veterans.